Bengaluru FC’s title aspirations were dealt a telling blow to after the Blues went down 3-1 to East Bengal at the Kanteerava Stadium, in Bengaluru, on Saturday. A Wedson Anselme goal in the first half followed by a brace by former Blues striker Robin Singh consigned Bengaluru to their first defeat at home in the League this season. CK Vineeth did get a goal back for the Blues but it was too little too late to salvage anything. The result stretched Bengaluru’s winless streak to seven games and left them on fifth on the table while East Bengal pipped Aizawl to grab pole position after the side from the North-East had briefly gone on top following a 1-0 win over Chennai City FC. With Amrinder Singh sitting the fixture out with a sore groin, Arindam Bhattacharya was handed his first start in goal for the Blues who started things with a 3-4-1-2 formation that saw CK Vineeth earn a start in attack alongside Udanta Singh. East Bengal shot into the lead against the run of play when Anselme did enough to move past Juan Gonzalez, open his body up and curl the take past a beaten Arindam. The Blues had a close shave in the 38th minute when Juanan made a last-ditch tackle to deny Robin Singh what would have been the simplest of tap ins from close. Bengaluru had their chance of the half only two minutes later when Vineeth nodded the ball from a tight angle past the face of the East Bengal goal only to find no blue shirt near enough to finish things off as they ended the half a goal down. Roca threw in an attacking change to start the second half with, bringing in Daniel Lalhlimpuia for Salam Ranjan Singh. The youngster squandered a big chance when he shot over from five yards out after Chhetri redirected a header at his feet. The miss would prove costly as Robin headed East Bengal’s second just a minute later when Robert Lalthlamuana sent in a cross from the left. Poor defending gave Robin his second and East Bengal their third when he slid to reach and bundle in a low cross to make it 3-0. 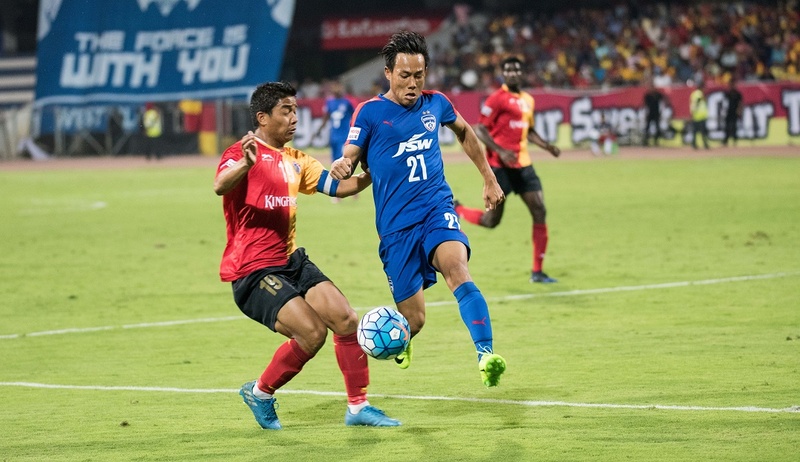 Staring at a very tall mountain to climb, Roca went for broke, throwing in Mandar Rao Dessai and Eugeneson Lyngdoh as the Blues pushed numbers in attack. Vineeth shot on the swivel only to miss by a bit before Chhetri saw two good chances cleared by a nervous East Bengal who were defending in numbers. The Blues did get a goal back in the 85thminute when Vineeth tapped home Udanta’s low cross. There was drama the very next minute after Bengaluru saw a goalmouth scramble put out in panic by East Bengal. Buoyed by the six minutes of added time in the second half, Bengaluru attacked only for Udanta to skew his shot wide from a dangerous position. Cameron Watson then saw a long range strike on target saved by TP Rehenesh. It was simply not to be for the Blues, as late efforts from Eugeneson Lyngdoh and Lenny Rodrigues sailed over the bar. Bengaluru next travel to Ludhiana to face Minerva Punjab FC on March 5th while East Bengal FC will travel to Meghalaya's capital to face Shillong Lajong on 4th March.